Hello friends, thanks for leaving us this opportunity. For those who don’t know the band, who are you? Hi. We're a 9 piece afrobeat/funk band from the city of Leeds in the north of england. We play afrobeat with a heavy space-jazz vibe. There's a big musical community in Leeds and all the members of the band had crossed paths at various points playing in different bands around the north of england. After discovering a shared love of afrobeat, Myself (Pete), Paul, Taz, Eddie and our first guitarist Gaz Parry organised some jam sessions at Leeds jazz club "Sela Bar". These jam sessions were totally improvised (we hadn't written any tunes yet!) and were pretty successful. Without a horn section to carry any melody (I just played percussion at this point) the tunes took on a textural and atmospheric sound with the use of delay effects and big reverbs that became an integral part of the bands sound (a good example of this is the tune "Big Grammar" on our first album that grew from these jam sessions). Encouraged by these gigs we recruited Martyn, Leon and Si to form the horn section and I switched to sax. We put together a few covers and a few originals and started gigging around Leeds. The head of First Word records, Aly Gillani, saw us at a club in Leeds and we signed with them shortly afterwards, writing and releasing our debut album in November 2010. One of the biggest influences of the major afrobeat bands today is non other that the father of Afrobeat, Fela Kuti. It’s a common influence between all of the members of the Ariya Astrobeat Arkestra? Absolutely. Playing afrobeat and not being influenced by Fela is like playing jazz and not being influenced by Charlie Parker! However, it's very important to us to not limit the scope of influence to just one person otherwise it'd be very easy to just sound like a bad recreation of his band. 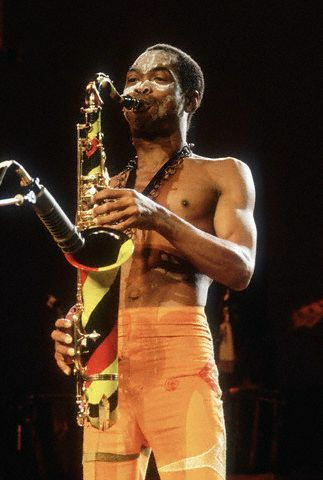 What is the significance of Fela Kuti to all of you? Fela is very much the spiritual figurehead of afrobeat. We're very aware of him, not just musically, but also politically and spiritually. It's important to remember that his music wasn't just for dance floors but for minds as well and it's important to us to try and continue his legacy of expressing political ideas through music. Our second album "Towards Other Worlds" is much more politically motivated, although it's difficult expressing these ideas through music alone! What means AFROBEAT to the band? Besides afrobeat, does other genre of music like to all of you? Do Ariya Astrobeat Arkestra have another project in a near future? Another album? We've just finished recording our second album for First Word called "Towards Other Worlds" which should be released November this year. We'll hopefully be going into the studio over the summer to record some new stuff too... Many members of the band also have side projects so Paul's been recording with his jazz trio "Eyes Shut Tight", Taz has been recording with "Submotion Orchestra", Kris has been playing with Kit Downes and the Threads Orchestra and Leon has been working on a live improvised work with the Drummer Paul Hession commemorating the death of Albert Ayler entitled "Ghosts" so we're pretty busy! Is there any tour or concert near where you be playing at? We'll be playing a few festivals in the U.K over the summer like Sunrise, Green-man, Guernsey and Rhythm Tree. We're also playing Soundwave Festival in Croatia in July. We should be putting a tour together in the autumn to promote the new album so "like" our Facebook page so you can keep up to date with any tour news! For those people who are interested where can buy the music of the band? Well guys, I appreciate the time you give us to do this little interview with Radio Patrimonios. To finish, and as we do with all musicians that we interview, do you like to share any message to our readers and listeners about music in particular or about life? THANKS A LOT TO PETE FOR THE INTERVIEW!! !